It was inevitable. All the Twilight movies are brought together in the Twilight Forever: The Complete Saga Blu-ray and DVD sets, but Summit does include some new stuff in the boxes. Twilight Forever is a 10-disc set on Blu-ray and 12-disc set on DVD, housing all five movies — Twilight, The Twilight Saga: New Moon, The Twilight Saga: Eclipse, The Twilight Saga: Breaking Dawn Part 1 and The Twilight Saga: Breaking Dawn Part 2, plus the extended edition of Breaking Dawn: Part 1. The discs also carrying the more than 10 hours of special features that are on the earlier DVD and Blu-ray release, including multi-part making-of documentaries, behind-the-scenes featurettes, cast and crew interviews, deleted and extended scenes, photo galleries, red carpet footage and music videos, as well as lots more. 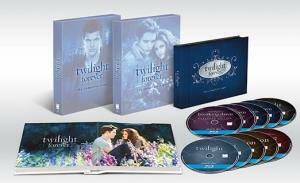 “Twilight Forever: Edward’s Saga” and “Twilight Forever: Jacob’s Saga,” highlighting the characters’ stories.